Last year, my husband and I committed to a more ‘minimalist’ life, and undertook a massive purge of material possessions. We sold, donated, recycled and tossed half of our household items. During the three month process, each item was under scrutiny. The process inspired us to consider global issues like circular economies — where does all the stuff go when you’re done with it? It also opened conversations about identity — do you keep all the camping gear because you actually camp, or because you still consider yourself a camper even if you haven’t done it in ten years? One particular collection gave us pause. 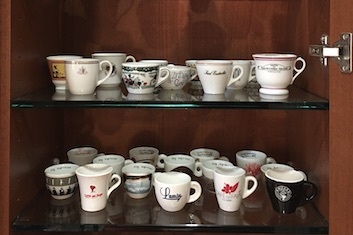 It was a collection of espresso cups, displayed in a glass cabinet in the kitchen. How could we possibly justify having hundreds of espresso cups, which we had collected over the years in our travels. It came down to this: each cup had a story. As we gingerly packed each one, we reminisced about the cafe or shop where we got it. In Rome. In Lisbon. In Paris. Businesses are like that. You have all these assets — people, ideas, intellectual property. But your business is more than a collection of data and facts. Together and individually, they tell a story about your company and its values, its aspirations and its purpose. We help you tease out those stories that make up your identity, and that illustrate your mission. C’mon, tell us a story.